The taxi driver in Ulaanbaatar asked double the price of what the hotel had told me. I had no more local money and was ready for a battle in the cold drizzly morning outside Ghenggis Khan international airport. I threatened to call the hotel which immediately produced the change he owed me but I got the receptionist to give him a piece of my mind in Mongolian anyways. I hoped it was not a bad omen. Corruption and unsavory business practices are apparently rampant. I had heard about it and now there was the experience. I was too early and this meant standing in this line and then that line while the uniformed men and women employed at the airport donned their white gloves and took their stations. It took a long time. The check in staff had no idea where Kinshasa was but they gave me boarding passes to my transit and final destinations anyways. Although I had gotten a Premium Economy Ticket on this Aeroflot flight, more expensive than the usual low fares I get, I was placed in the middle of the cabin. I grudgingly let go of my fantasy which only knows premium from long haul/wide body flights – narrower than B-class but more spacious than the back of the bus. I consider a 6.5 hour flight a long haul but we did it in a small plane that had no fancy premium chairs. I reseated myself in the middle of an empty row and held on to it throughout the boarding process – tense moments. When I stretched out to sleep I realized there were damp blankets all around me (or maybe someone peed in his/her pants) – that kind of smell. The cabin crew told us first in Russian and then in accented English that alcohol not provided by the airline was not to be consumed. It was 6 AM in Ulaanbaatar and I hoped this was not going to be an issue. I slept, read and puzzled and suddenly we were in Moscow. As we moved west across the steppes, Siberia and then the -Stans I noticed that we went from treeless to heavily wooded by the time we landed in Moscow. I was last in Moscow (not at the airport) in 1974. If someone had told the Soviets then that their airport would look like any other airport in the world (Africa north of South Africa excepted) forty years later he would have been tried for treason. There is an TGIFriday and countless Starbuck look-alikes, fancy perfumes that produce sneezing attacks and alcohol galore. Other than the Cyrillic script and the abundance of Aeroflot planes there is no way of knowing I am in Russia. I am looking for oligarchs in the business lounge and wonder if they could be female. The business class lounge has salami and herring (not combined) sandwiches and there is vodka of course. But there is also oatmeal porridge and fancy petit-fours. The free internet promptly crashed my computer, if such is possible. My virus defense force gave me notice that a Python virus had been caught. Imagine that! I hope my computer’s vaccinations are up to snuff. Next sign of life from Paris, incha’llah. The second day of the alignment meeting even less people showed up. I suppose the meeting needed to be renamed ‘Alignment Light.’ We were at half capacity. The representatives from other ministries must have decided there were other more important things to do and so we lost some critical perspectives. But all the wheelchair users were there – this is important to them, they have the most to gain from this initiative and I suspect it will be their perseverance that will get and keep things moving. Energy levels went up and down throughout the morning and after lunch the downhill trend set in, not unusual, to continue deep into the basement. With only 15 people left and only 2 in position of any authority, we ended at 3 PM, two hours before the scheduled time. We had enough good stuff to crawl into the next phase – one learns to adjust one’s expectations. What resulted was some action on transportation access, some action on creating a multidisciplinary and multi stakeholder committee to focus exclusively on wheelchairs, complete a proposal to Korea about setting up workshops and keeping momentum going. A third group is working on constructing a model building, not a new project but something that can be used to show what a wheelchair accessible (inside and outside) building looks like. The owner of this project, a private prosthetics business woman, invited everyone to the opening. A fourth group focused on developing a plan that will eventually produce a pool of local trainers. This will require some extensive negotiations between various interested parties, among them Deseret, an organization of the Latter Day Saints, that donates wheelchairs plus training, a package deal. All in all I am optimistic. 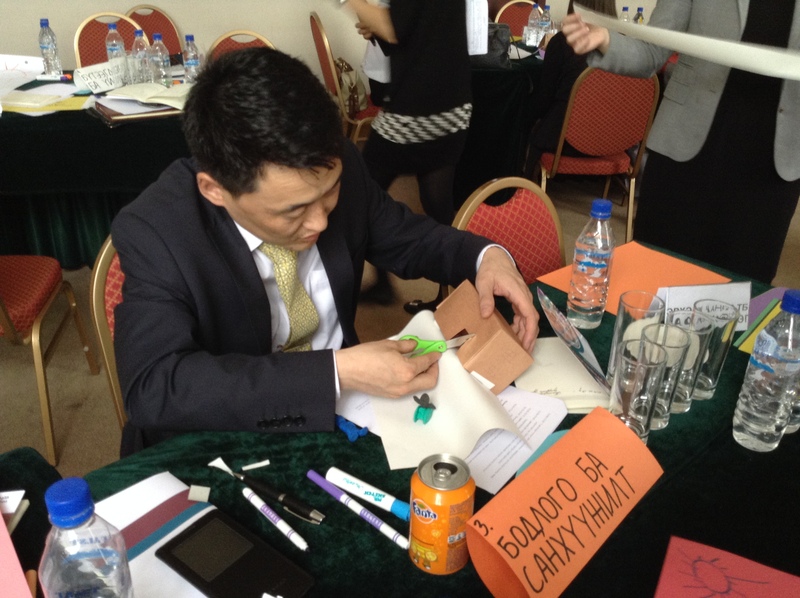 Mongolia is at the very beginning of a long process of developing its capacity and infrastructure to meet the needs of wheelchair users. Since my only other example is The Philippines I might have overestimated what is possible here. We had a nice debriefing with the USAID mission director and his Georgian program manager over lattes and espresso. We all paid for our own beverage, as we are supposed to, something we learn every year in our procurement integrity course. I was glad there was no awkward moment. The USAID mission is small here, only 2 expats, and, we were told, shrinking, if such is possible with that few people. Back at the hotel Maggie and I had our last meal together and then it was time to pack. Maggie is lugging an empty suitcase back, except for the cashmere stuff she is buying. So I was able to drop some things off at her room and continue my journey just a tad lighter. On Wednesday we started the final of our three events here, the one I am leading. Some 35 representatives from various organizations involved (or to be involved) in wheelchair services had been invited. About 25 or so showed up. We have a few Americans in the room and so translation remains a challenge because we have to translate both ways and not just for the facilitator. One of our translators volunteered to come simply because she was curious about the unusual methodology – we ended up using her quite a bit and hopefully we can pay her. The highlight of the day was the creation of a shared vision. Getting people to visualize a desired future was a challenge with reluctance to close eyes, many people not returning after lunch and constant cellphone interruptions which, though silent were still interruptions. People cannot seem to turn cellphones off or ignore calls. But once the visualization was done and participants were urged to use all materials in the room (this included modeling clay), everyone started playing, with an abandon I haven’t seen before. Faces lit up and the usually serious and unsmiling faces relaxed. We stood around each table as they pointed out their dreams for wheelchair access in Mongolia. After the break we started to tease out the common elements and it was as if I had put people back in their traditional school benches. The energy dipped, the energy slipped and at 4 PM, one hour ahead of time, I called it a day as there seem to be no point in continuing with the small group. I felt as I was wading through molasses. When I announced the end of the day people started smiling again and energy returned – energy applied to packing up. It was our last evening with our Filipino friend and master trainer and we had her select the restaurant for our farewell supper. We went to a Mongolian hot pot place and ordered spicy hot pots, dumplings, thin mutton slices and a basket full of vegetables, accompanied by a large Ghenggis beer and then we parted. We are now in the phase were everyday someone is leaving. Me tomorrow for my trip to Kinshasa and Maggie will close the ranks on Friday night, returning to DC. About three quarters through the managers’ workshop our translator shared with us that many (most?) of the 45 or so people in the room did not understand why they were there, why they were selected for the training and what the point was of these nice foreigners telling them how to run a wheelchair service. They had no wheelchairs to give away and if they did they were not at all of the quality that we told them was acceptable. Furthermore, they didn’t expect any of such wheelchairs anytime soon. We were teaching about budgets but budgets are handed down from above. I cringed. This was everything that critics of development aid throw in our face and usually I counter by saying we don’t work like that. But here we were. We called an emergency meeting with our main counterpart, who we had expected to be with us, follow all the trainings and explain how this training fit into a larger plan. He speaks very little English and had us believe, some time ago, that he followed what we were talking about. Not so. Any of the context setting and opening speeches had been vague about the purpose and thus the frustration of the participants was entirely justified. We rectified all this with more speeches and pointed out that the managers were ‘laying out the path in walking,’ to use a well-worn quote. In the final reflection people seemed to understand their situation better. 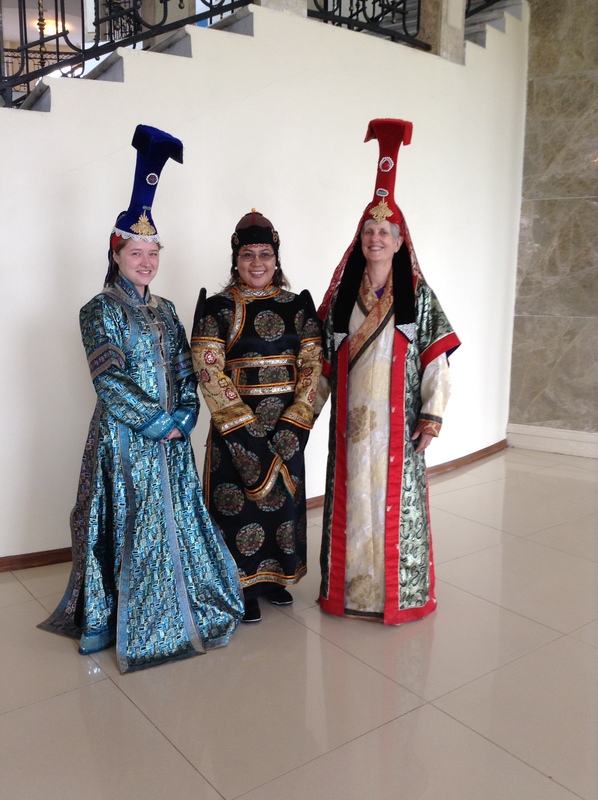 One person mentioned an HIV training she had received years before HIV became a problem in Mongolia and then she realized the value of her training. Maybe people were just nice and polite to us. Monday morning we received some 45 of the 64 expected managers to help them understand the implications of setting up a wheelchair service in their centers. We had divided our roles between the three of us and are each responsible for 3 to 4 sessions. The social workers came in uniforms. They look like police officers but without a whistle and a cap. This was a good thing we decided, as they look rather intimidating. The other participants come from health centers run by the government and from the national rehab center. Only one person is in a wheelchair, the PR manager of a wheelchair users group who Maggie and I invited at the last minute. The make up of this group stands in sharp contrast with the Philippines where wheelchair users occupy some of the highest positions in agencies that look after people with disabilities. It is very tricky to teach with a translator. Participants get easily bored when the translator talks to us in English and we miss of course a great deal. But from time to time we can see people perk up as they talk about the universal organizational phenomenon: managers who don’t understand them and do bad things to them. I reminded them that they too are managers and therefore can break the chain. When not in front I sit by the side chatting with the translator who is not on duty. We argue about American’s role in the world (her: you are bombing people into democracy). I try to explain that, while I am not in favor of bombing anyone and anything, the situation is a bit more complex, especially when it comes to Islamist fundamentalists. She is an interesting mix of Europe and Asia – a Portuguese father and a Mongolian mother, both attracted as young idealists to Moscow to be part of the communist movement in the 50s or 60s. 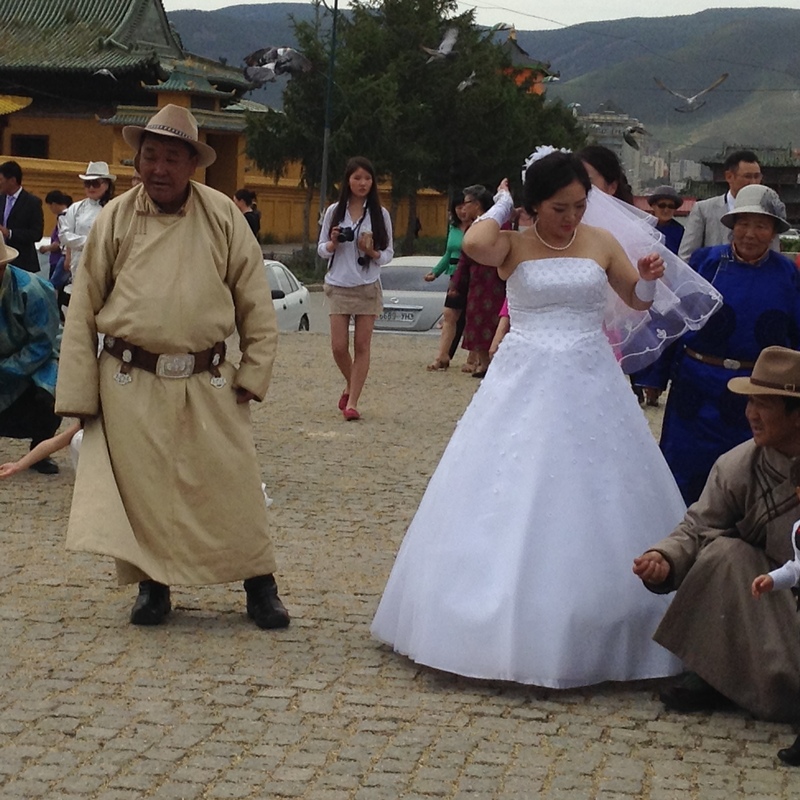 She points out to me that under the communist regime, Mongolian women earned the same as men, everyone had access to health services, education and housing, though standards may not have been as high as in the west. After the start of Mongolian democracy in 1990, these numbers have been slipping and ordinary people are worse off, especially the women. In the west these advantages of communism were usually ignored or downplayed. But I do remember these facts well as I studied Russian history, political economy and social life as part of my graduation electives. It seems that here the baby was thrown out with the bathwater. We got into this conversation because I had noticed that most of the participants were women. However, I was told, these were midlevel managers. The ones at the top were most likely men who are highly political party bosses. Our translator has little love lost for the way her country is governed these days, with corruption and bribes creating economic hardship for many. On Sunday it rained and was cold, like early April in Massachusetts. We set out with two colleagues from the Rehab Center who kindly sacrificed their day off to show us a small piece of their enormous country. The roads are rough, with holes everywhere – I will complain less back home. The winters do a terrible job on the asphalt and repairs are probably postponed. Mongolian drivers are among the worst drivers I have seen – on the daily route to the Rehab Center we see at least three or four cars stopped because they ran into each other. Cars go left and right to avoid pot holes and drivers are rather selfish (this is actually not so unique). Trying to get into a line or cross a busy street is nearly impossible, so I suppose one learns to be selfish and aggressive. We stopped by the side of the road where two mangy (or were they simply shedding) Bactrian camels (two-humped) were tied to a stake by the road. Our Mongolian hosts indicated we should get out and ride the camel about 20 feet one way and then 20 feet back. We also were offered a large leather mitt on which an enormous bird was placed, weighing more than Faro – an eagle I suppose – with huge talons and beak but eyes that showed no more life in them than one would observe in a plastic replica. The spirit had gone out of this bird and one could easily understand why – sitting by the side of the road in a bleak landscape, being carted to and from work in the boot of a car and tied to a pole. He (she?) and a mate, even larger with a wingspan of about 2 meters, were like the dancing bear or performing monkey. Our Mongolian hosts paid the 25 cents for each of us, contributing to this terrible practice because of politeness and a little curiosity.We returned to the car, wet from the drizzle, our hands smelling sour from the inside of the mitt and the camel’s coat. 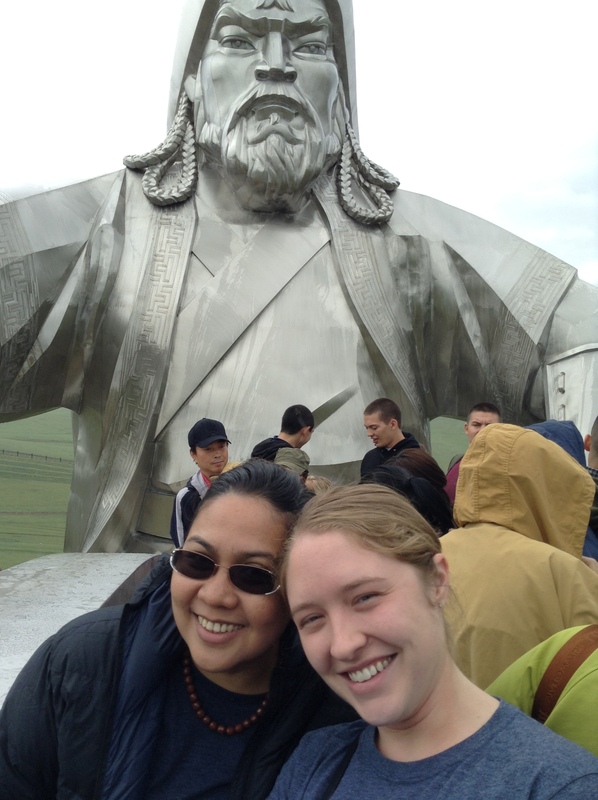 We continued our journey (54 km east of Ulaanbataar) to the Ghenggis Khan Statue Complex. I had expected a series of slightly larger than life status with Mr. Khan in various poses. Instead we saw the largest equestrian statue in the world. Sitting proud and tall and made from 250 tons of stainless steel, 40 meters high, Mr. Khan, the national hero, dominates the landscape. He looks east towards his birthplace. His statue sits on top of a circular pedestal with 36 columns representing the 36 khans (Ghenggis being number one) to Ligdan Khan (presumably number 36). Inside the base is a museum, a movie theatre, a restaurant, post office, and two gift shops plus a 7 meter high replica of his riding boot. 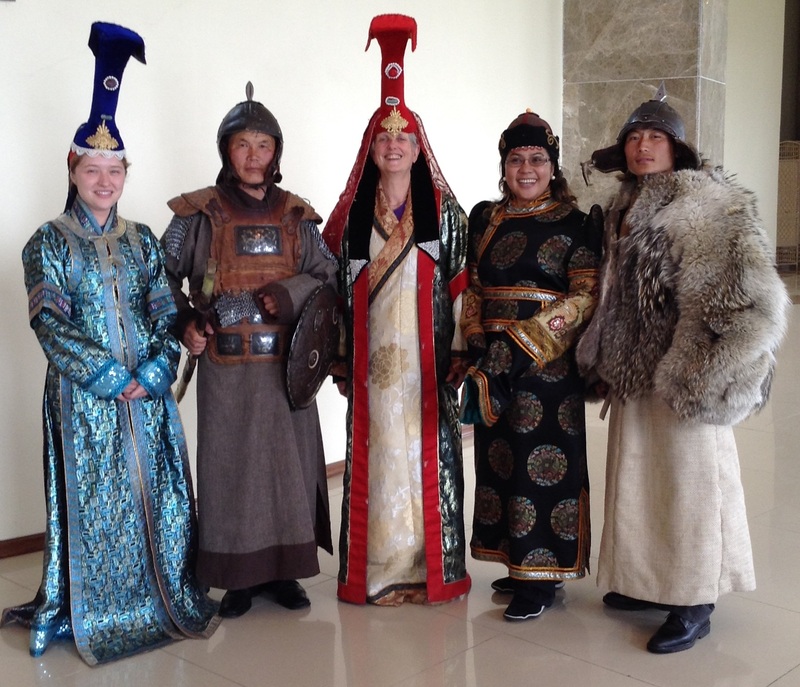 For a couple of dollars you can ‘rent’ some traditional clothes: fine embroidered gowns and fancy hats for women and rough leathers and wolf furs with chainmail, helmets and other war faring paraphernalia for men. You can then roam around the complex in your gowns and make pictures to your heart’s content. Of course we did so and enlisted some local men in their scary outfits to join us for various group photos. We walked up a very narrow staircase inside the back of the horse to emerge between the horse’s ears with a close look at Ghenggis’s face and the surrounding landscape. A few of the lodging yurts are already in place but the landscaping has barely started. Here too there are no trees – a few scraggly ones planted as part of a more grandiose plan to match the grandiosity of the center piece. We drove back in more drizzle, zigzagging across potholes and avoiding other cars doing the same. We made it back in one piece and without a scratch, had a late Japanese lunch and settled into the local Starbucks look-alike for a macchiato to divide roles and responsibilities for the managers’ workshop that starts tomorrow. Saturday was a day of play and rest for Maggie and me while our trainers completed their last day. Our guide and interpreter took us to the Gandan Monastery which is located on the edge of the city. It was established at its current location in 1838 and grew over the next century into a complex that included 9 dastans or institutes, a library and housing for some 5000 monks. It attracted people from all over who practiced the Tibetan form of Buddhism. I recognized the similarity with the monasteries Axel and I visited in Sikkim some years ago. In 1938 the communists destroyed most (some 900) monasteries in the country. Five of the Gandan monastery temples were destroyed and what was left served as barracks for Russian soldiers or barns for their horses. The monastery did continue to function, although under strict supervision and on a very small scale during the rest of the communist era until the Democratic Revolution of 1990. Now the place is thriving again and expanding. There are 10 temples and some 900 monks. Our guide keeps calling them monkeys, not out of disrespect but because she confuses the words. After all, if one is monk, two might well be monkees. It is a logical mistake. An enormous golden statue (my guess: some 3 stories high) of the Bodhisattva of Compassion, Janraisig (Chenresig in Tibetan) stands in the center of the biggest temple which has become a symbol of independence for Mongolians. The original was carted off to the USSR and can be seen in the Hermitage we were told. How they got it out of the building (and how the Mongolians got a copy back in) is a miracle, the latter attesting to the craftsmanship of the Mongolians. In other temples monks were reciting from the (Tibetan) books of prayer, rocking back and forth. 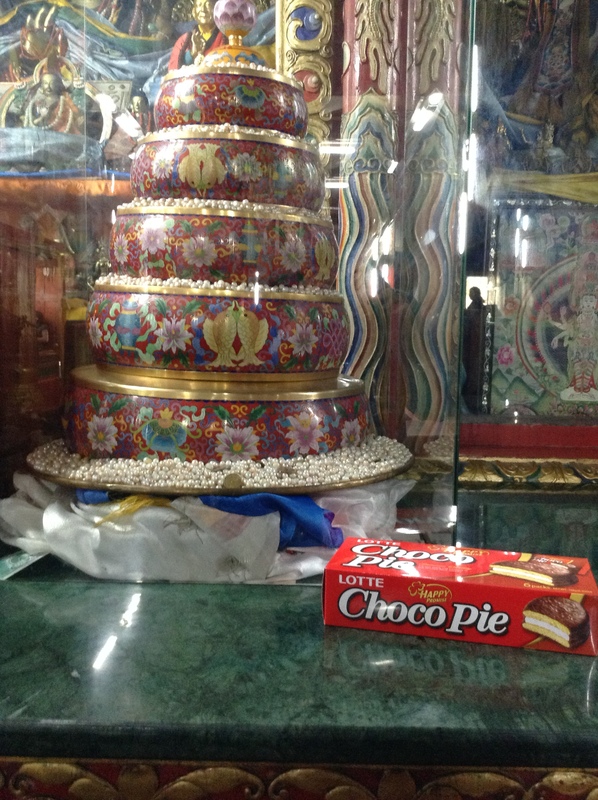 They received gifts, like boxes of Choco Pies which were placed next to religious artifacts, creating some dissonance for me but apparently none for the locals. We followed our guide and received blessings from several monks by bending over in front of their seat. They placed the prayer book on our forehead. Leaving the temple is a bit tricky with the uneven stones and high thresholds because once cannot turn one’s back on what is inside the temple. It occurred to me that for wheelchair users a visit to this temple is at least for now, out of the question. An American gentleman started to follow us and listen in to our interpreter’s explanations. We invited him to join us and discovered that he is a visiting OB/management and strategy professor at a Chinese university and was in Mongolian to cross one item of his bucket list, a motorcycle ride across the steppes. He had already done one from the most southern tip of South America to Alaska. He is a circumnavigator, an elite club of people who have gone around the world a few times. It includes many celebrities, among them the former queen of Sikkim, who I knew about from our Sikkim travels. 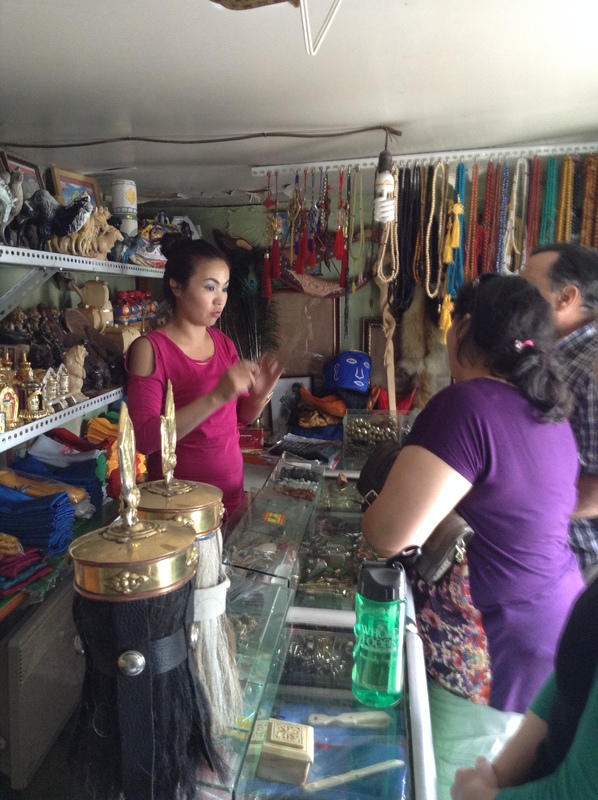 Outside the temple complex are souvenir shops that sell trinkets, mass-produced art and amulets for protection against the dangers of the world. 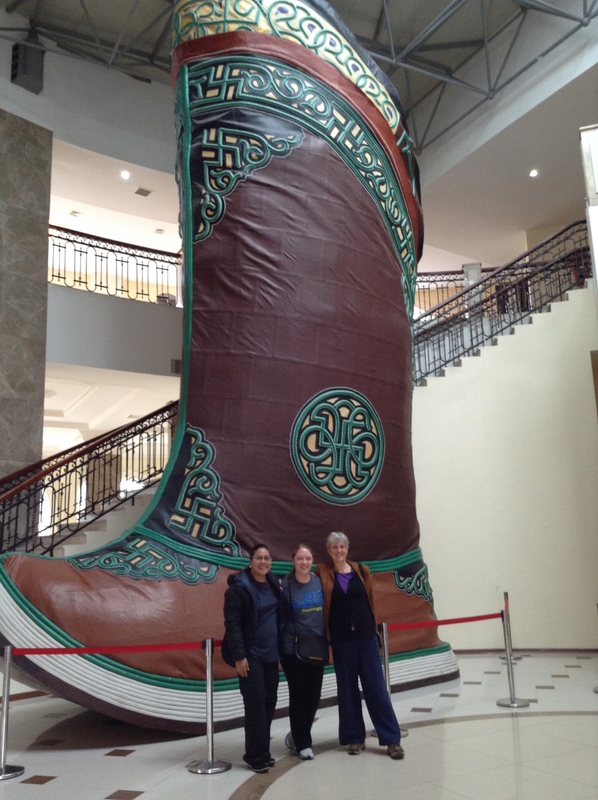 We decided that our new friend needed to buy some protection against the dangers of traversing Mongolia on a motor bike. Maggie and I bought a charm to protect me against flattery and her against interferences to doing a good job. For a dollar and a quarter each, we also bought 9 hedge hock quills in a shaman’s shop. A dollar and a quarter is not much, we reasoned, to protect us against the dangers of travel. We did not buy the more powerful protection, in the shape of an embroidered roll, for 25000 Mongolian Tughrik (about 14 dollars), considering this a tad too much for superstition.